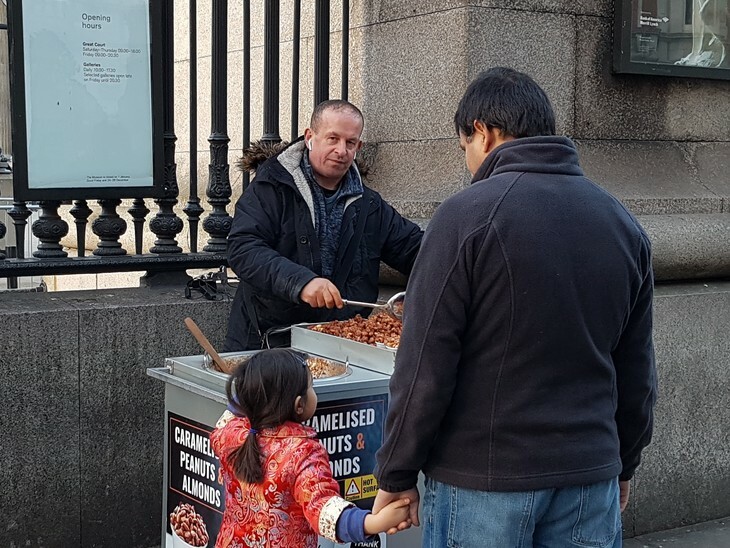 Who Are The Guys That Sell Hot Nuts On London's Bridges? James FitzGerald Who Are The Guys That Sell Hot Nuts On London's Bridges? You've never eaten a single one. But as sure as the sun will rise over England tomorrow — as sure as there'll be a February half-term next year — as sure as there'll be a rickshaw man in a padded gilet hovering outside Leicester Square tube right now — it won't be long before you next smell London's caramelised nuts. There's simply no mistaking that aroma of the sweet, candied nuggets sizzling away on a little metal tanning bed. Blossoming in winter, they cast great clouds of the nuts' saccharine scent around the Tower of London, the Tate Modern and the capital's many river-bridges. How'd you describe that particular fragrance? Candy floss? Warmed-up Nesquik? Nostalgic, perhaps Proustian, notes of a patisserie firing up its ovens early in the morning on a quiet side-street in Paris? That much we learned on a mission to uncover the men and women behind the metal trolleys. Peya: "A weak pound means more people coming here, spending money. Like… on nuts!" Peya, from Bosnia. Photo by James FitzGerald. We meet on the Millennium Bridge. Peya is passionate about business and food. "This is a German recipe," she informs us, before talking us through nut/sugar ratios, and her bulk-buying strategy that guarantees maximum profit margins. Turns out it's a lot more technical than just standing there in a coat and stirring a bit. "Well, that's just how you make good money each day", Peya says. How much? "I’m not telling you! Much better than minimum wage, I will say that." With a background in hospitality and hotel work, Peya's now saving up for a master's degree in business. She insists that London's full of opportunities for anyone with an entrepreneurial spirit. "Just look at the upside of Brexit. A weak pound means more people coming here, spending money. Like… on nuts! "Weekends are good for me. And I'm already looking at when people will come for the Easter, or for Harry and Meghan's wedding..."
A speaker of four languages, Peya's story is one of frequent displacement and some sadness. Raised in Bosnia where "we grew everything ourselves, except our coffee", her family was forced to flee to Austria when her village fell victim to ethnic conflict in 1991. 11 years later, she came to London. "I've been back home only twice," she says. "Once in 2015, to bury my father. "My dream is to return to that area one day, to own a lavender farm on the island of Hvar in Croatia. It's a dream, but I think it can be achieved." Jim: "Look away from the trolley even one minute and you lose a customer, or you burn everything." Jim, from Montenegro. Photo by James FitzGerald. "When I heard them killing people, I didn't even look around. I didn’t even pick up the trolley. I just ran." Jim, from Montenegro, says he was working on London Bridge on the night a terror attack unfolded there and in nearby Borough Market. The memory is clearly a traumatic one; its events visibly painful for him to recollect. "Am I scared to work there again? Yeah, I am. I think I probably won’t go back at all." Speaking while being mobbed by scores of eager customers outside the British Museum, Jim tells us he's shocked that the 2017 atrocity could have happened here in "friendly" London. He, too, considers himself to have been displaced by some distinctly unfriendly conflict in the former Yugoslavia. He arrived here in 2000, lives in Greenwich, and has hardly looked back to the Balkans. "My life is here now," he says. "I do this a couple of days a week. And work in the car wash the other days." When I heard them killing people, I didn't even look around. I didn’t even pick up the trolley. I just ran. While he insists he's content with his lot, Jim paints us a picture of the hardships of the job. "Look away from the trolley even one minute and you lose a customer, or you burn everything," he explains, signalling at the cauldron thing before us. Toilet breaks? "In there," he motions to Starbucks, "after you’ve done four hours of standing at the trolley." Moving the bloody thing around? "It's like a shopping cart," he confirms. Jack: "I tried putting in honey once. I think people weren't ready for it." Jack, from Kosovo. Photo by James FitzGerald. "I've been doing this for about 15 years," beams Jack from Kosovo, "and yes, I do still love the eating them. I even buy them from other people. Jack's dedication has seen him perfect his own nut recipe that, it's probably fair to say, is crunchier than most. "I've had time to experiment," he says. "I tried putting in honey once. I think people weren't ready for it." But it turns out his dedication is not only to the nuts. His wife is disabled — and as well as supporting her via this and his other odd jobs, Jack wants to be there for his two sons, who are training to be electricians. One of them even has a shot at making it as a professional footballer. I do still love the eating them. I even buy them from other people. 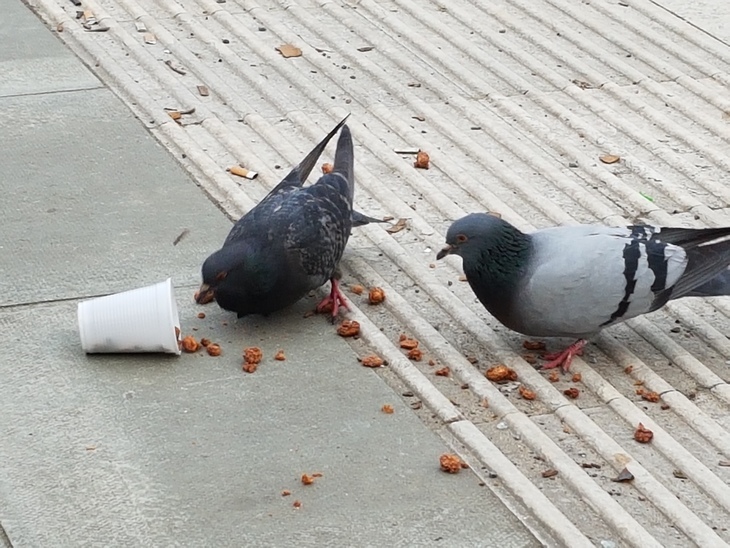 "It's not a great living, but it's OK," he shrugs. "What I do, I do for them." 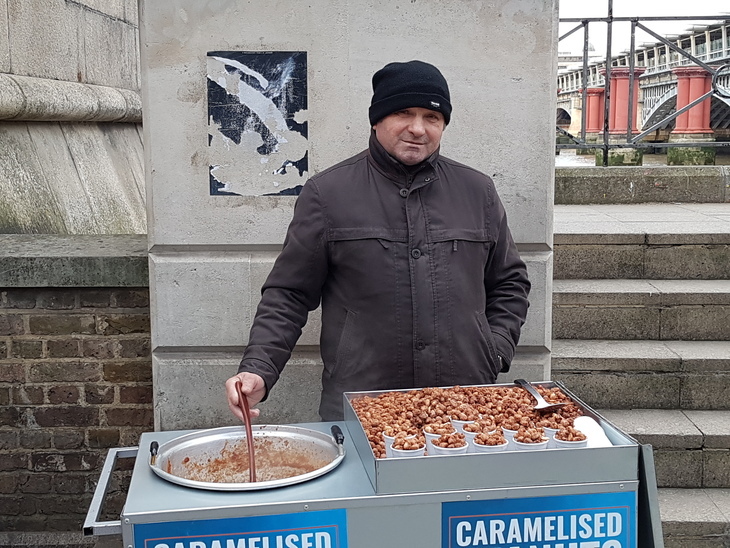 Standing in a narrow passageway on the South Bank that leads into Blackfriars station, Jack seems to act as an enthusiastic human signpost for tourists and lost Londoners, at least as much as he acts as a seller of caramelised nuts. "I'm always aware of where I am," he remarks. "You have to be. "It's harder to do this in Westminster and Lambeth now. The councils always try to tell you to move on." Another accepting shrug comes next. "They're just doing their jobs, like I’m doing mine." 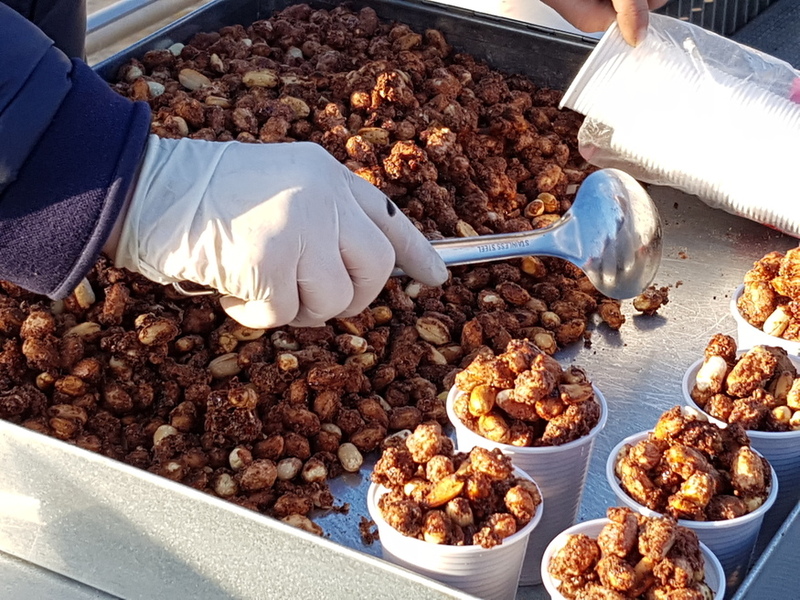 Both Lambeth and Southwark councils confirmed that selling caramelised nuts is like any form of street trading: it requires a licence. 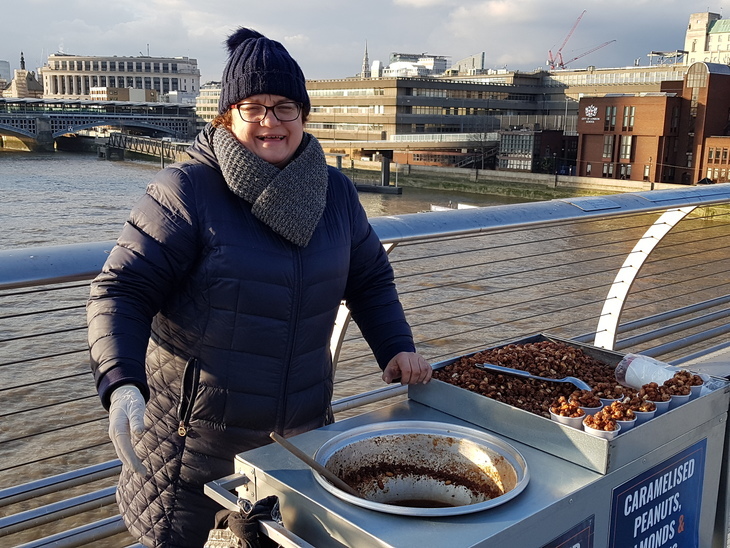 A spokesperson for Lambeth tells us, "There are pitches that can be legally allocated to traders on the basis that they maintain food hygiene standards, set up in sensible locations, and operate safely. "Sadly many of these hot nut sellers have not even tried to get permission, instead choosing to trade illegally." Both authorities pledged their commitment to cracking down on the practice; Southwark even revealing that there are no caramelised nut sellers licensed to trade in the borough (except one in an annual Christmas market), and that all its bridges are out of bounds — even to those with a licence. The question of how the hell you know what you're eating is always a fair one. In a city that's increasingly regulated (some of it for good, some of it for bad), these traders won't last forever. For now, taking a gamble on one of those sweet morsels might just buy you an extraordinary life-story at the same time.